All that was going to take a while, so I'd called ahead to Sales & tipped em off that I wanted to try a K12 'before making any decisions'. They didn't have a K12R available sadly (which is the one I could most likely afford) but I was able to try both a K1200R Sport and an '07 K1200S back to back for an hour each. - Gear selection seems almost irrelevant, though S labours a little in top below 70mph... Yikes! - Still quite windy on the R Sport, despite fairing. I was getting a lot of head noise & could feel wind on my shoulders (more so than R12S) probably because of the fairly straight bars? - Overall, so amazingly easy to ride and so blindingly quick - it's like they've twisted the dial round on the speedo to read 30mph higher. There is no acceleration, just 'picking a number' and then being there - awesome. Test ride a R1200R and you'll be swapping pink slips! I traded my K1200S for a R1200R and I wasn't even looking to swap! Just like you,I test rode a K12R when my rockster was in the shop to have a leaking final drive seal replaced (for the 2nd time). I traded for a K12R a week later and have never regretted it. How much more upright was the riding position on the K12Rsport compared to the S? And you are saying you liked the non-ABS brakes? I also rode two different K1200Ss recently. One was an 05 and the other an 07. The 05 suprisingly rode better than the 07 (maybe because of the higher mileage) but both had phenominal performance compared to my 02 RR. I found the S very easy to ride and it seemed lighter than my R even though it is fact slightly heavier. Bothe bikes had ESA but, to be honest, I wasn't riding at the limits of the bike so found the variance between the settings hard to notice. I was very interested in purchasing a new bike but the local dealer here does not seem interested in selling me one. They lent me a K1200S for a half-day ride but then took 10 days to follow-up. I am still awaiting some definite figures from them on a specific bike and a trade-in price for my RR. 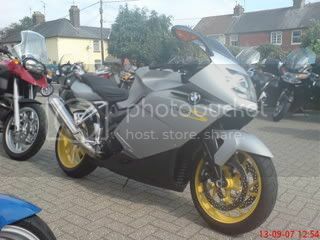 Anyway, that aside, I have since spoken to two K1200S owners both of whom were critical of the gearbox when hot and one was about to trade his for a R1200GS. Ideally I'd like to keep the RR but have a KS as well. adg44 wrote: ... How much more upright was the riding position on the K12Rsport compared to the S? The R Sport is a lot more upright with flatter bars, compared to the S with it's clip-ons. The fairing is still wide & quite big overall, but the screen is still fairly low & I was disappointed with the windblast relative to an RR - although it is quieter & you are of course going a lot faster! Both the K bikes I rode had ABS brakes, but from '07 models they are non-servo assisted like the current R12R and GS. The front brake bite and grip enable you to slow down faster than I thought was possible - if I were going this way then I think I'd definitely choose an ABS bike. MartinW wrote: ... Bothe bikes had ESA but, to be honest, I wasn't riding at the limits of the bike so found the variance between the settings hard to notice. Martin - Bahnstormer near Alton (at the former SPC site) are keen to do business, they have the immaculate blue bike above & gave me a price-to-change on the spot. Not far past Farnham on the A31 / A32 - nice location for a test ride via the A272 to Winchester! I agree with you on the ESA, unless perhaps you do a lot of mixed loads (solo, pillion, with/without luggage etc). It's a big-money option otherwise. Thanks Hirsty. It's where I bought my RR from when it was SPC so I know the location but haven't paid a visit there since Bahnstormer picked up the pieces. I know what you mean about the A272 although I believe it is often targeted with speed cameras. Location: Buffalo Grove IL Chi Town Sub. 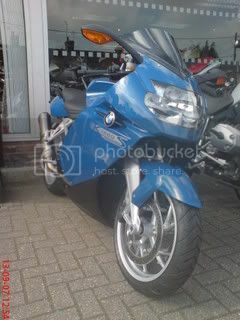 hass wrote: Test ride a R1200R and you'll be swapping pink slips! I too have ridden the R1200R, and if I had my choice, it would be it! RIDE TOO PRETEND, PRETEND TOO RIDE.